Monday, December 10 – Insilico Medicine, a Rockville-based company developing the end-to-end drug discovery pipeline utilizing the next generation artificial intelligence, will present its latest results in modern and next-generation AI for Drug Discovery at 2018 Future Tech Forum, on December 14 in Taipei. 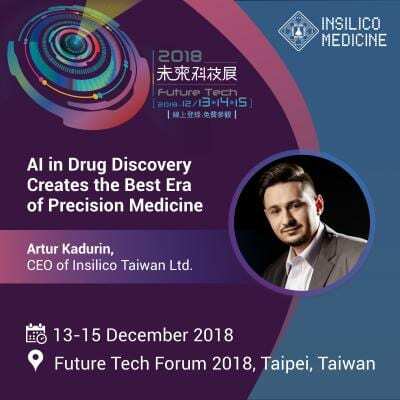 Artur Kadurin, Chief AI Officer and CEO of Insilico Taiwan, will deliver a keynote address titled “AI in Drug Discovery Creates the Best Era of Precision Medicine” during the Precision Medicine Forum. Mr. Kadurin will elaborate on current global healthcare trends and share insights into how Artificial Intelligence (AI) is emerging as a vital tool for drug development, creating the most accurate medical treatments of the future. Mr. Kadurin will account for Insilico’s international cooperation strategy, giving reasons for choosing Taiwan as its Asian R&D base. Insilico Medicine launched its first Asian AI R&D base in Taiwan at the beginning of 2018. Insilico has partnered with Taiwan’s Development Center for Biotechnology (DCB), the Institute for Information Industry (III) and TUL Corporation to form the “AI Digital Health Talent Development Program,” to jointly develop AI expertise. Future courses on digital medicine, blockchain, and big data-related topics are being planned to strengthen Taiwan’s AI talent pool, solidifying Taiwan’s role as an AI R&D base for the rest of Asia. Following Mr. Kadurin’s speech, experts from the fields of venture capital, academia, and clinical practice will engage in a panel discussion titled “Taiwan’s Chance in Precision Medicine is on Integration,” to further analyze international Precision Medicine trends and Taiwan’s role and contributions. Participants will include Dr. James Chih-Hsin Yang, Director of the Department of Oncology, National Taiwan University Hospital, Dr. Hsing-Pang Hsieh, Associate Director of the Institute of Biotechnology and Pharmaceutical Research, National Health Research Institutes, and Michel Chu, General Partner at Acorn Campus Taiwan. Current, standardized, one-size-fits-all medical treatments of cancer and other diseases neglect patients’ individual differences, leading to highly inconsistent results. Such treatments can be extremely effective for some patients, while completely and frustratingly ineffective for the others. The new paradigm of “Precision Medicine” takes into account unique differences in individual patients, as well as the genetics of different kinds of cancers. Through deep understanding of each person’s genetic composition and the genetic variability of each tumor, Precision Medicine can create unique treatment methods, tailor-made for concrete patients and specific diseases. Taiwan’s Precision Medicine industry is still developing. However, with rapid progress and deployment of new AI tools, combined with Taiwan’s deep pharmaceutical industry expertise and clinical trial knowledge, the 21st century promises to be a new era of Precision Medicine for Taiwan. The Future Tech 2018 Exhibition, organized by Taiwan’s Ministry of Science and Technology (MOST), will include exhibits in four primary domains: Biotechnology and new drug development, Medical devices, Applied AI, electronics and optoelectronics, and Metal treatment chemicals and advanced materials. The Future Tech Forum will highlight three primary subjects: Precision medicine, Innovative AI applications, and Quantum computing. CEO of Insilico Taiwan Ltd.